The Royal Bank opened its first branch in Penticton in the early 1920s and shortly afterwards moved to its current downtown location at Main Street and Nanaimo Avenue (shown in photo). The RBC Foundation has donated $70,000 to help provide medical equipment for the Penticton Regional Hospital expansion. (Photo courtesy of Penticton Museum & Archives). With its Penticton ties dating back almost a century, RBC couldn’t pass up an opportunity to support Penticton Regional Hospital. The RBC Foundation is proud to announce a $70,000 donation to the South Okanagan Similkameen (SOS) Medical Foundation’s drive to provide the medical equipment for the PRH expansion. 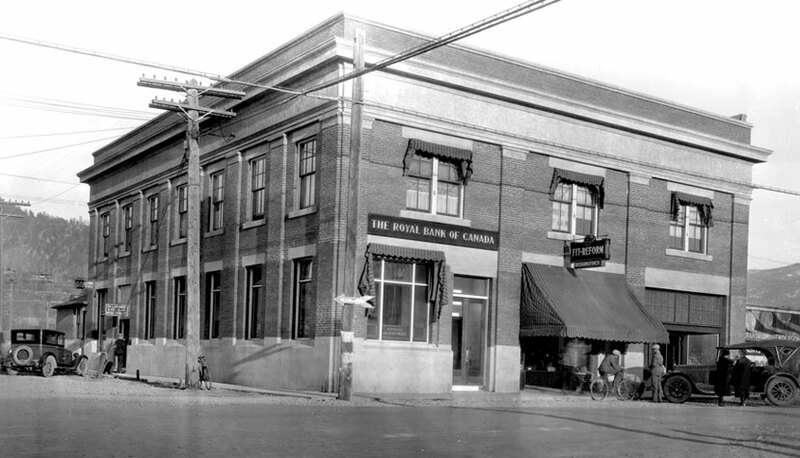 The Royal Bank of Canada has long been an integral part of the community, opening its first Penticton branch in the early 1920s. Amy Bergen, manager of RBC’S Apple Plaza branch, said each of the two current branches in the city has about nine employees, plus a number of investment and mortgage specialists, and other partners. Bergen grew up in Abbotsford, but has long had close ties to Penticton. “We came here almost every single year on vacation, so that made the move easy,” she said. Bergen and her husband and their two teenaged children have lived in Penticton for 13 years. Amy has been with RBC for the past three years, including the past year as manager at the Apple Plaza branch. For RBC to support the hospital campaign was not a difficult decision, she said. Part of the RBC corporate philosophy is an understanding that wealth refers to more than just one’s finances. It also includes a sense of prosperity and well-being in the communities in which we live and work. Carey Bornn, Executive Director of the SOS Medical Foundation, said RBC’s gift provides a real boost to the $20-million PRH equipment campaign. “This donation from RBC reflects what tremendous support this project has received from all sectors of our community. Simply outstanding,” he said. The new six-storey PRH tower will be ready for patients in April 2019 after which construction will begin on Phase 2 of the hospital expansion, including a major upgrade to the Emergency Department.